There’s no doubt that doing NaNoWriMo is a slog and sometimes you need a break from fighting through all those words by yourself. So, the other Saturday I went along to a NaNoWriMo ‘Write In’ in Birmingham city centre. The organisers had reserved several tables in a café and, apart from the expectation that each participant would purchase refreshments from the café, the event was free. When I arrived it was easy to spot the novelists – they all had laptops and their fingers were dancing over the keyboards. It was at this point that I realised I hadn’t fully thought through what a NaNoWriMo event might entail. I’d come armed with a notebook because I wanted a break from the computer screen and time to think about some additional plot twists and/or characters. I hadn’t expected to see such industry. Nevertheless I was made welcome. As well as offering the time and space to write, chat or do whatever else NaNo related you fancied, there were some organised activities during the afternoon. We were given the word of the day to incorporate into our stories. It was ‘pyknic’, meaning ‘short and fat’. Then it was time for the first ‘Word Wars’ session. The aim was to write as many words as possible in a timed 45 minute session. Without a laptop it was difficult to join in but the silence and atmosphere of work during that time was fantastic and I found myself scribbling outlines for several possible scenes to act as triggers over the forthcoming days. It was definitely time well spent. There was an interlude to catch our breath and discuss general NaNo stuff. Also at this point the origami bunnies were brought around. For every 10k words completed, a bunny was awarded. I got one because at that point I had around 17,000 words done. Coffee cups re-filled and cake bought it was time for another ‘Word War’. As I was leaving a ‘Word Sprint’ was getting under way. Each individual picked a lolly stick at random. The stick contained a number of words and a time limit in which those words should be written. So, for those lacking motivation or those just needing/wanting to get through a whole pile of words – get yourself along to a NaNoWriMo ‘Write In’. But don’t forget your laptop! This entry was posted on November 17, 2013, 9:00 am and is filed under Events, Writing, Writing Exercises. You can follow any responses to this entry through RSS 2.0. You can leave a response, or trackback from your own site. That sounds a lot of fun. Well done for joining in even without your lap top… And well done for doing nano in the first place! Sally you are an inspiring writer. Just reading the few words you have written on NaNoWriMo makes me want to have a go! I do hope your inspiration to others proves fruitful for you to come up with your first full novel. Not sure whether this will lead to a publishable novel, Shirley. But I’m enjoying having a go. Sally, 17,000 words in half a month is a major achievement – you deserved the bunny! What a lovely event. It would be good to see more of these even if not connected with NaNoWriMo as the industriousness of others writing does rub off! I agree, Tracy. There’s nothing as inspiring as seeing others hard at work! There’s always next year, Hilary. Perhaps you could have a go then? I hope it’s third time lucky, Susan! And what a shame you burned the autobiography. I think most ‘first’ novels are not the author’s first ever attempt at writing a novel – everyone has piles of failed novels somewhere. But hopefully practice will make perfect! Even though I’m not doing NaNo, it’s interesting to read about the event you attended and I’ve been following Facebook ‘friends’ progress, as well as hopefully supporting them with encouragement. You sound as if you’ve done well so far – congratulations and keep upthe good work! Thanks, Anne. It’s great to have the encouragement of others. I’m on about the same. It’s interesting to hear about your write ins as they sound slightly different from ours. We had fifteen minutes writing and fifteen minutes off on the word wars day. We get given stickers for hitting 10 000. 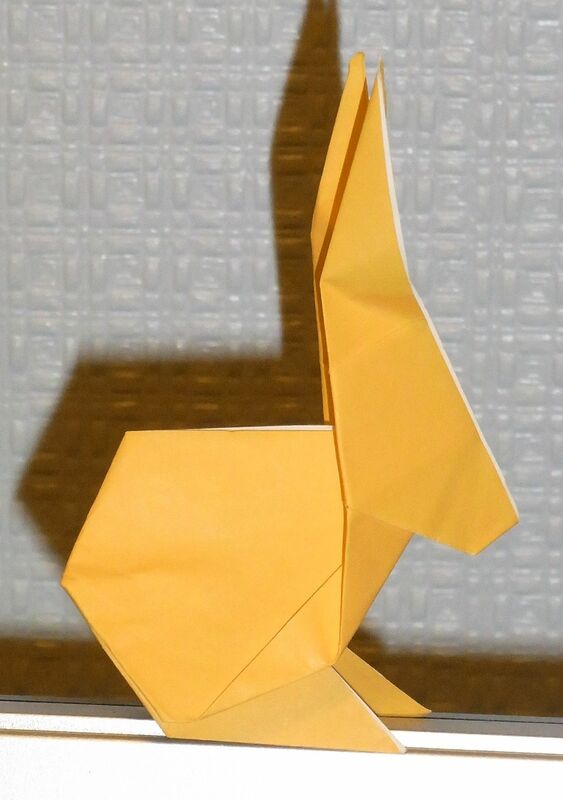 I like the idea of the origami rabbits, very quirky. Well done, Rachel! I suppose each area runs their write-ins as they see fit and as long as it gets everyone writing then it’s a success. And everyone appreciates a reward, whether it’s a sticker or a rabbit! This is one of the best things I discovered about NaNo. Writing in the company of other people, either in the real world or online, really does boost your creativity. Cheering you all the way! Thanks, Linda. And I’m pleased you’re doing it next year! Thanks for the visit. I have not tried NaNo but mange to put down about a thousand a day on my own. Maybe next time. A thousand words a day is pretty good discipline, John. Up until a few days ago I had never heard of NaNoWriMo but this is the second post I have read on the subject. I can’t see myself taking up the challenge but I can see its merits. I don’t believe it is possible to write a good novel in a month but one could certainly use that month’s writing as a first draft which I assume is one of the main ideas about NaNo writing. I certainly do appreciate the discipline it takes to write a 1000 words a day. You’ve got it right, Chris. the aim of NaNo is to get a VERY rough first draft which can then be worked on for as long it takes. Which in my case might be a very long time! I may try this. What I have doing up until now is to enter competitions. I use the closing dates as reference points to finish what are usually short stories so that gives me something to aim at. I subscribe to a writing magazine to find out all the competitions that exist in the UK. However, the NaNoWri thing may be worth ago. Short story competitions are good discipline, Chris. And NaNo is good to get the first rough draft of a novel. Good Luck with it all!